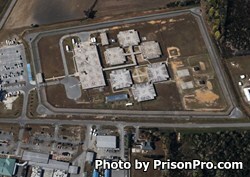 Located in Robeson County North Carolina, Lumberton Correctional Institution is a medium security prison that houses 768 adult male offenders. The prison is comprised of six dormitories and a twenty cell segregation unit. Offenders are secured by multiple razor wire fences with electronic detection systems and an armored patrol. While incarcerated at Lumberton Correctional Institution, offenders can receive adult basic education and obtain a GED. Inmates are provided mental health, medical, and dental services. Vocational training is offered in carpentry, HVAC, and electrical wiring, which are all skills an inmate can use after their incarceration to obtain a job. Inmates at Lumberton Correctional Institution are allowed visits by appointment only. You can schedule an appointment by calling (910)-618-5574, ext. 235. Tuesday through Friday. Visits occur on Tuesdays, Wednesdays, Thursdays, and Fridays from 9am-4pm.